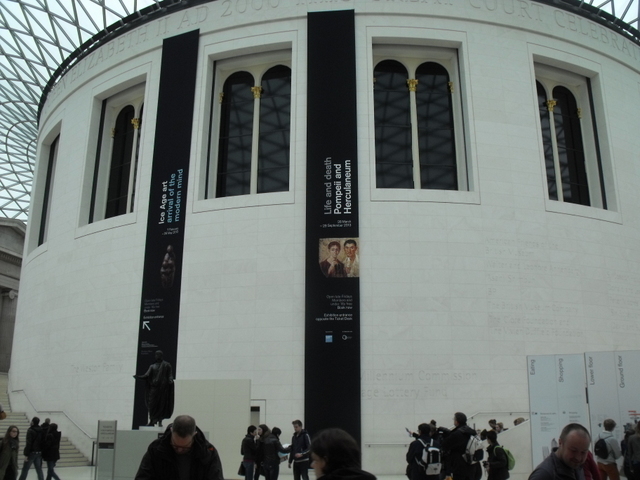 I love the British Museum more every time I visit. Pompeii and Herculaneum were destroyed by the same volcano AD 79, in but in different ways, so that different kinds of things survived in the buried wreckage. 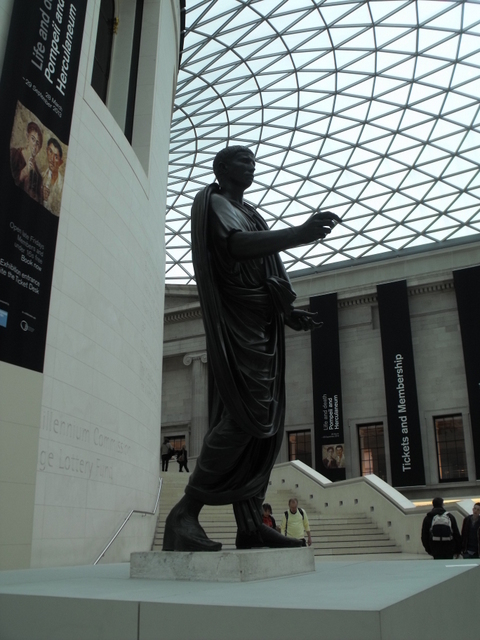 Now the British Museum has cleverly put items from the two together to give a vivid picture of Roman life in these towns, which were unusual only in the horrifying way in which they died. 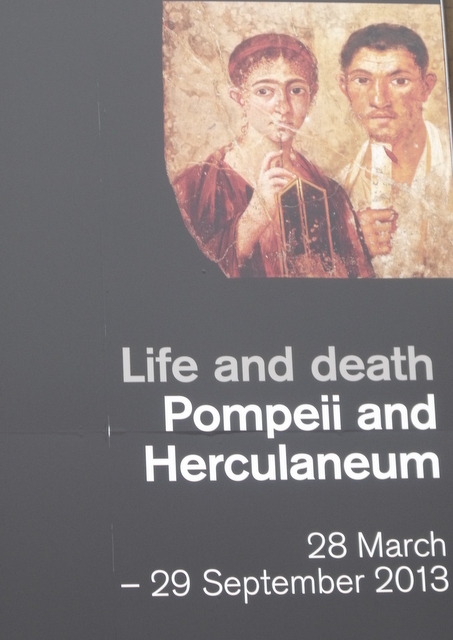 Husband and I have been to both sites in the past but most of what we saw yesterday was new to us, largely because the Herculaneum museum was closed when we were there and the Pompeii material is housed in Naples. Naples is not the place to venture if you have naively booked a hire car, you only have a long weekend and you have never driven in Italy before. We’ve seen photos, of course. I’ve read books. You can walk through both towns on Google Street View. So while I expected to admire and enjoy, I didn’t expect to be terribly surprised. The first surprise was the social mobility. We all know that Roman slaves could be, and often were, freed. They could build up wealth of their own and their children would become freeborn Roman citizens in their own right. What I hadn’t realised was how often it happened. On the engraved list of male citizens in Herculaneum (there would have been about 500, from a population of 4-5000), over half of them are freed slaves. On the right is one of them: Lucius Mammius Maximus. He became a wealthy benefactor of the city and this statue was put up in the theatre. Until now it hadn’t occurred to me that the faded figures in the background of some of the frescoes (yes, there are whole walls on display!) were not faded by time and volcanic action, but because they were painted that way. They are of course the slaves, waiting in case the main subjects need assistance with whatever they’re doing, which is sometimes private in the extreme. Where slaves have to appear in the foreground (serving dinner, for example) they’re often disproportionately small. Playing ‘spot the slave’ is a good game. And interestingly, much use of the written word in both towns is in contexts where only slaves would see it. The labelling on amphorae, for example. They might be slaves, but they were not ignorant. While we’re on social mobility – how cheering it is to see evidence of women running businesses and owning wealth in their own right. Makers of ancient-world movies where young women are incapable even of doing their own clothes up, please take note. The second surprise was the Stuff. So much of it. So ornate. 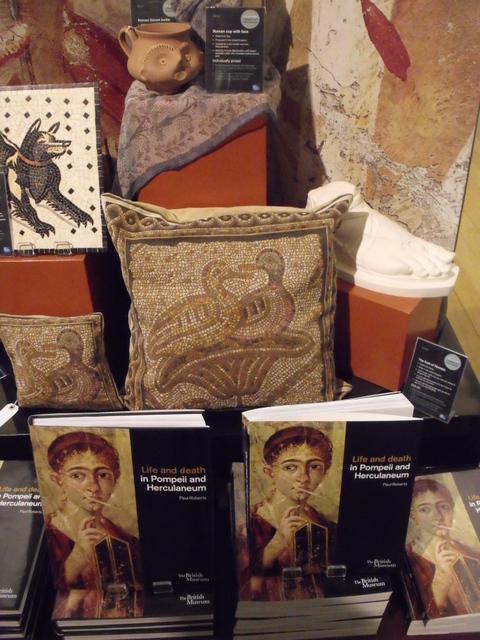 Roman society was, as curator Dr Paul Roberts pointed out, all about power, and display of wealth and status. That’s why you would have your strongbox displayed in a prominent place in the house, not cunningly hidden from burglars. Harry Enfield’s ‘look at my wad!’ character would have fitted in very nicely. That’s why you would have beautiful silverware on display, and lovely fountains playing to help you and your guests relax in the garden. Meanwhile, back in the tiny, stuffy kitchen, the slaves would be fetching water with buckets, and the toilet, used for dumping all sorts of waste, was right next to the cooking-hearth. The third surprise was about that well-known painting of a man selling the loaves of bread that are stacked up around him. I’ve always wondered why he seemed to be sitting cross-legged on a kind of platform, and handing the bread down, instead of moving about behind a counter like a normal shopkeeper. Apparently he isn’t a normal shopkeeper. According to the blurb, there’s an election approaching, and he is handing out bread to the citizens. It’s not an illustration of everyday life at all. It’s a campaign poster. Now it makes sense! Beyond the surprises, there was an accumulation of cheering details. When you write historical fiction you spend many fruitless hours pondering the practical ways in which people used to live. It’s long been obvious to me, and surely to anyone who thinks about it, that normal Romans would not be gadding off to the baths every time they needed a wash. And they weren’t. To my relief, the kind of washing-bowls that I’m sure I must have written into the books (or implied, at least) did exist. There was one on display. Ditto chamberpots (one with two natty extensions on the rim for comfort). There was a useful-looking cooking pan with six little dips in that might have held poached eggs or cakes, and the mystery of what stoppers were made of is finally solved. Amphorae could be sealed with plaster but what of bottles that had to be regularly opened and closed? Wood, fibre or cloth, apparently. Phew. It’s unlikely to appear in a book but it’s nice to know. Oh, and dormice. I know every fictional Roman banquet has to include dormice, but they really did eat them. You could even keep them in a special pot with built-in feeding bowls while you fattened them up. The most thought-provoking exhibits, though, were not – for me – the famous plaster casts of the dead. They are shocking, but I have seen them before. What really brought the disaster home to me were the collections of once-useful items that the victims had chosen to take with them, and which were rendered irrelevant in the face of the catastrophe. A soldier died on the beach at Herculaneum wearing his military belt, his sword and his dagger. Many people had grabbed jewellery and coins. One girl had a collection of good-luck charms. People took keys to doors that ceased to exist when they did. Most moving of all, I found, was the set of surgeon’s instruments that had been neatly stored in a protective case, so that the owner would be ready to help someone when needed. 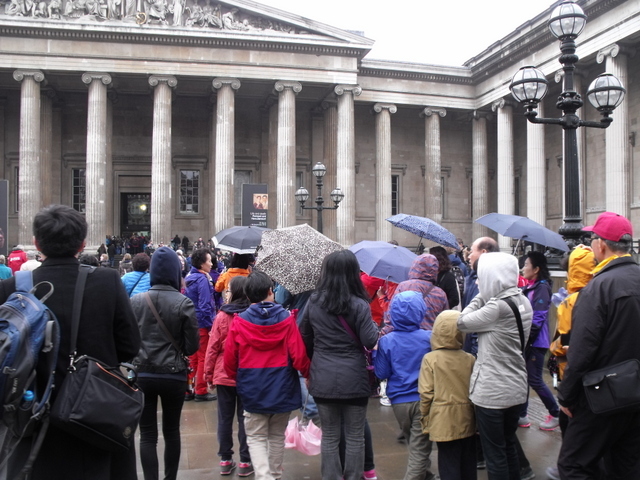 The British Museum site has the info and there’s a promise of an iphone/Android app coming soon. Meanwhile if you’re thinking of going – do book. It was packed. There are other events happening in conjunction with the display, so check out the events page for a chance to see Robert Harris and/or Lindsey Davis, amongst others. Thanks Leah! Sorry about the dearth of photos but there are a few on the Museum website. Oh dear Andrew, sorry to tantalise! I gather they’ve had Pompeii exhibitions in the States in the past so maybe one will come your way soon. There’s certainly a huge amount of interest in it – apparently not only here but also in the Italian press, which I wouldn’t have expected. definitely sounds worth a trip into London. I may pounce on an inset day and take younger son with me. On reflection, you do need to be aware that there is ‘adult content’ on display. Amazing what things take with them in an emergency. And what they consider important. Mark Twain considered one person in particular among the refugees, who stopped for his money chest. Fascinating post, Ruth, and what a wonderful-sounding exhibition! I must certainly get down to London by hook or by crook (or probably train!) I’m off now to look at the B.M. website – the Internet really comes into its own for something like this, doesn’t it? I always say the Romans would have loved computers and their Empire would probably still be going strong if they’d had them. Hope you enjoy it, Karen. At least you won’t have to bunk off school this time!